A good trackball is hard to find. That wasn’t always the case, but in today’s world of super-high DPI mice, quality sphere-based pointing devices aren’t easy to come by. Don’t worry, I found one. While I appreciate a nice mouse for gaming and general use purposes, I am an old, old man who grew up in a time when trackballs were just as prevalent as roller-ball mice. Did you know the first Kirby game was programmed using a trackball? How about the fact that the trackball was invented in 1946? See? Trackballs are so cool. The trackball was everywhere in the ‘80s and ‘90s, and that includes gaming. I owe all of my success in the original Unreal Tournament to being able to rapidly change direction while still maintaining precise reticle control, all courtesy of a large ball being rolled under my fingertips. 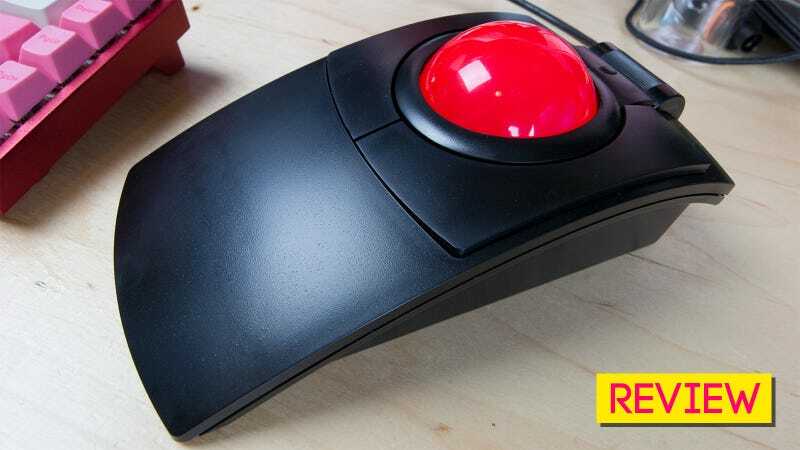 While the rise of laser and optical mice has made trackball’s pretty scarce, but you can still find good ones if you look hard enough. Companies like Logitech and Kensington still manufacture a nice variety of units. And then there is Clearly Superior Technologies (CST), the El Cajon, California company that’s been making trackballs since it launched as a family business back in 2003. The L-Trac Glow is the latest model of the spiritual successor to the company’s PC-Trac. It’s a laser trackball capable of switching from 400 to 1,600 counts-per-inch. It’s got three buttons, a large scroll wheel, and a brilliant translucent red ball (also available in blue) that lights up when in use. The model I am reviewing, the CST2545-5W(GL), also features a pair of jacks in the back where two optional buttons can be can be connected, bringing the grand total to five. Price: Amazon sells the version with external button ports for $130, while the version without the ports is $125. A two-pack of external buttons runs $32.50. Honking Large: As a large-handed man used to completely engulfing normal computer mice in my ginormous paws, the L-Trac makes me feel like a little kid again. The base is nice and broad, large enough for my expansive palm to rest for hours on end. Considering my relative size, it might even be a bit too big for smaller-pawed humans. The optional buttons are pretty basic, but they feel awesome. Smooth Moves: One of the biggest problems I used to have with trackballs in the old days is getting them gunked up. Either I’ve become a much neater person or the phenolic ball inside the L-Trac is highly-resistant to picking up crud. Either way, I’ve been using the trackball exclusively for over a month with no degradation to the rolling action. This equates to excellent control, whether I am playing a game like Overwatch, writing an article about trackballs or Photoshopping Stephen Totilo’s head onto a giant robot, which is something that happens sometimes. The Scroll Wheel: Almost more of a scroll log than a wheel, the massive dial is now my favorite way to make a web page go up and down. Configurability: Though CST’s Superior-X Button Control software may look primitive, it’s a quick and easy means to assign special actions, adjust trackball sensitivity and make those optional external buttons useful. Look! It even makes the Scroll Lock key useful. With the ability to set program-specific functionality, the L-Trac plus a couple of option buttons can function as a tiny macro factory. I Don’t Have to Move My Hand: I mentioned this in my trackball love post last month, but screw moving my hand. It’s Not Very Fancy: Aside from the big glowing ball, the L-Trac is a large hunk of black plastic. It’s a highly functional hunk of plastic, but there’s not much going on with it. To some that’s a plus. I’d like a little more flair. Custom button colors, maybe different options for the ring around the ball itself. It’s not a massive downside, I just need something to keep me from tearing it apart and trying to decorate it myself. A Dated Experience: This isn’t so much a problem with the device itself, but rather the experience of looking for and obtaining one. CST has been making quality trackballs since 2003, the year it looks like their website was created. The L-Trac arrives in a very plain box with simple printed instructions. The configuration software, though quite useful, looks like it’s been around for quite some time. I am excited about good trackballs, and I want other people to be as well. It’s not easy to talk about them as a viable computer controlling device for the modern day when the website and packaging feels like a trip back in time. Is the trackball past its prime? Having spent more than a month now with CST’s L-Trac Glow, I’m positive there’s life in my preferred pointing device yet. It may not be as precise as a laser mouse, but I still feel as if I get a finer degree of control with my fingertips doing the walking. That, and there’s something glorious about giving the ball a wild, chaotic spin, catching it and regaining control. It’s certainly more fun that I’ve ever had with a mouse.